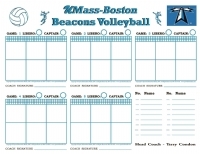 Each full page volleyball roster card set is COMPLETELY CUSTOMIZED to your particular specifications and printed on 4-part carbonless paper. Write one and have three instant copies, one for the umpire, one for your opponent, one for the announcer or official scorer and one for yourself. Check out these features: â–ª Standard lineup space for 6 players, with their number and position clearly indicated, and room for substitutions. â–ª Carbonless forms are glued along the top edge for easy separation. â–ª Standard set has a white top sheet, yellow, pink, and a white hardback last page. The non-hardback option utilizes a gold last page. â–ª Full Page Lineup Sheet is 8.5"h x 11.0"w â–ª Color – The standard set prints the first (white) page of each set in color. There is no limit on the number of colors we can use. Please be specific with your colors when ordering (Navy Blue, Forest Green, Yellow Gold, etc.) and attach any of your custom color artwork with your order. â–ª Artwork – you can attach your own artwork for use on your cards when you order or let us choose among our graphics. 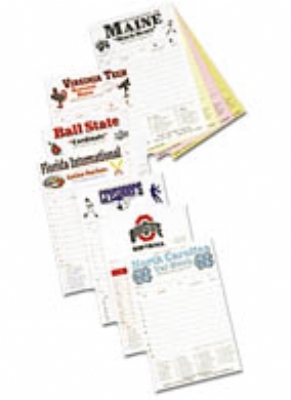 â–ª Use of one of our styles or let us design a card just for you (call us for customized styles)!